There is a sea of books and blogs that can teach you a lot about a place before you visit, but the best way to experience a place and get to know a culture is by having a local show you. 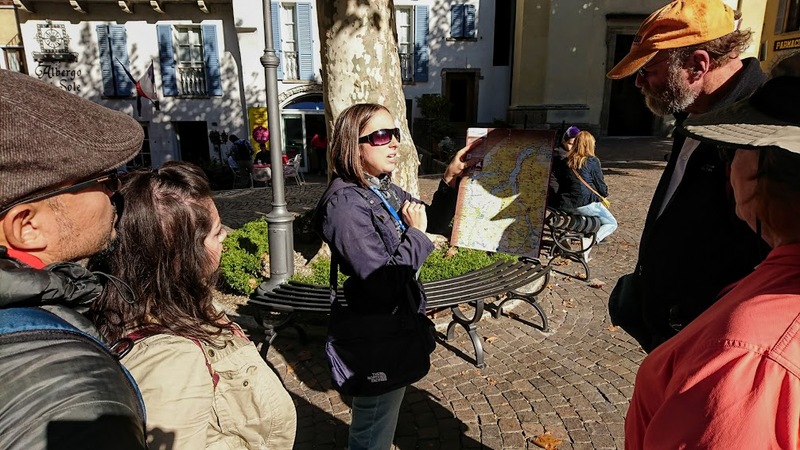 With the help of Alesandra, a professional guide of Lake Como Food Tours I experienced the flavors and colors of Varenna, Bellagio and Villa Balbianello. In a small group of six, we saw the sights and scenes of Lake Como from shore to shore. I did a two-day boat and food tour with a group, but you can book a private tour, small groups or choose from their selection of experiences like biking, hiking or even cooking. On day 1 I did the Walking Tour of Lecco, Boat Cruise & Lunch. Today, I did the full day Central Lake Tour starting from Varenna. I really got to see Lake Como at its best. The meeting point was at the ferry landing in Varenna, a short train ride from my base in Lecco. I love taking the train in this area; it’s always full of excited tourists. This morning I must have heard at least six different languages. Trains run regularly from Milan, passing through Monza and Lecco. Get off at the Varenna-Esino-Perledo station. It is a short walk downhill to the ferry. Train travel tip: If you are traveling from Milan, going north towards Lecco and Varenna sit on the left side of the train facing forward. The lake is on the left side and once you get out of the tunnel after Mandello del Lario the views are spectacular even from the train. Going back south towards Milan, sit on the right and you will coast the Adda River as well. After meeting the other guests and Alessandra, our certified tour guide and native of the area, we were picked up in a minivan and brought to our first destination. Perledo is a hamlet above Varenna. Hidden in the woods along the Wayfarer’s Trail is an antique mill. The mill dates back to the sixteenth century and was used to produce both flour and oil. Cinzia and Fabio are the managers of the mill today and have taken on the ambitious task of restoring the mill to its original working condition. In addition to working on the mill and teaching tourists and schoolchildren about traditional production methods, they also produce an exceptional olive oil, Terre del Lariosauro, which won a Gold Medal at the Los Angeles Extra Virgin Olive Oil Competition. They named their oil after the Lariosauro, the first pre-historic reptile fossil found in the region. Cinzia had set up a table of local meats, cheeses, fresh bread and of course olive oil. She gave us a little lesson on how to taste olive oil. She showed us how to warm the oil and then she said “Only a little drop” and then she slurped. In order to taste an oil properly, you have to slurp it. It was great fun slurping and swishing the oil. We tasted Bresaola, a cured beef, Salami and Tallegio cheese from nearby Valsassina. All accompanied by a local red wine called San Martino made with a mélange of 70% Merlot grapes and 30% locally grown grapes. Considered one of the pearls of Lake Como, Varenna lays at the base of a hill, cuddled by an inlet, and dotted with colorful houses and floral vegetation. Alessandra took us through the town to visit the churches and along the promenade to take in one of the most beautiful views of Lake Como. Varenna is built directly into the hill and has stone staircases leading you through alleyways of romantic restaurants, luxury hotels and charming residential homes. I was most impressed by the church of Saint George. A non-descript, unassuming building in the center of town. There are few frescos, but the artwork found there is very poignant. The image of the devil eating a man alive is very powerful. We had a pleasant lunch at Il Cavallino restaurant. We had the choice of a meat menu or a fish menu. I tried the fish menu; an appetizer of lake fish. Agone and Lavarello (which are local fish and don’t seem to have translations) and Trotta in Carpione (pickled trout) are the local specialties. I also had a pasta dish with a tomato and fish ragu sauce. We drank the house white wine and for dessert finished with a lemon sorbet and espresso coffee. We did la passagiata, the traditional walk after a meal, taking in the views of the lake and distant Alps. I was travelling by myself today, but Varenna is the perfect location for a romantic getaway. We headed down to the dock where Luca from Taxi Boat was waiting for us. We boarded the Retro, a Venetian style, open top wooden boat which holds about 12 passengers. Luca expertly drove the boat while pointing out landmarks, explaining the local history, and sharing some gossip about the local celebrity villas along the shore. We glided across the water with “Con Te Partiro” sung by Bocelli blasting from the stereo. A unreplaceable moment of impressive beauty, elegance and abandonment from everyday life. Everything a vacation is all about. We came upon Bellagio and turned down the Como branch of the lake arriving at a peninsula jetting out from the shore. Upon the hill was a magnificent mansion, the Villa Balbianello. Once a Franciscan monastery, and later was owned by Guido Monzino, explorer and author of several books about his expeditions. After his death in 1988, he left the villa and gardens to FAI – Fondazione Ambiente Italiana, as a museum and public treasure. Today it is not only a tourist destination, but also used as a movie set (Casino Royale and Start Wars) as well as for luxury destination weddings and special corporate events. I took over 100 photos just of the visit to the villa. There were so many details, angles and views to capture. This definitely goes on my list of “Absolute Must Sees of Lake Como”. Our final boat ride dropped us at Bellagio. We stopped for a quick ice cream at the Hotel Splendide artisan ice cream shop. During the Renaissance and Baroque periods, Bellagio became a popular resort area and noble families built luxurious holiday homes along the shores of Lake Como. Many of villas and gardens we visit today were once vacation homes to Italian and Swiss lords and ladies. We walked through the streets of Bellagio passed the fashion boutiques, street cafes, and galleries. At the top of the hill in the main square is the Basilica of St. James (San Giacomo). Inside you will find a wooden sculpture of Jesus displayed in a glass case. It was most likely washed away after a flood from a Spanish settlement near Colico. Legend says that it was found floating in the lake by fishermen during the time of the plague. After it was brought to the village, the sickness disappeared and no one else ever suffered from the illness. The tour ended here in Bellagio. I took my time going back to Varenna by ferry and then Lecco by train. It was a full and very satisfying day of natural beauty, delicious food and a sparkle of luxury all in one. I highly recommend Lake Como Food Tours. It was an absolute pleasure visiting Lake Como with them. Alessandra, the tour guide, was extremely knowledgeable and professional. Her English was excellent and she was very patient with all our questions and curiosities. Elena and Laura, who work behind the scenes, managed everything flawlessly. Are you interested in booking this tour? By clicking “Book Now”, You will be directed to the Lake Como Food Tours tour operator’s secure booking system. By booking with LakeComoStyle.com, there are no additional fees. Feel free to contact me for inquiries or additional information.